The US Treasury Department Office of Foreign Assets Control (OFAC) sanctioned 271 employees of Syria’s Scientific Studies and Research Center, the agency allegedly responsible for producing chemical weapons, the Treasury Department said in a statement on Monday. WASHINGTON (Sputnik) — The United States will pursue anyone connected to the use of chemical weapons in Syria and shut down their financial networks, US Treasury Secretary Steven Mnuchin said commenting on the move. "We take Syria’s disregard for innocent human life very seriously, and will relentlessly pursue and shut down the financial networks of all individuals involved with the production of chemical weapons used to commit these atrocities," Mnuchin stated. Mnuchin also said the United States was sending a strong message to the Syrian government and President Bashar Assad over the April 4 reported chemical weapons attack on civilians in Khan Sheikhoun, for which the United States blames Damascus despite lack of proof. "Today’s action, less than three weeks after the attack on Khan Sheikhoun is one of the largest ever executed by OFAC," Mnuchin stated. "In a single action we are more than doubling the number of individuals and entities sanctioned since the start of the Syrian conflict pursuant to Syria-related executive orders." Mnuchin added the United States will continue to pursue and shutdown financial networks of anyone involved in Syria’s alleged use and production of chemical weapons. 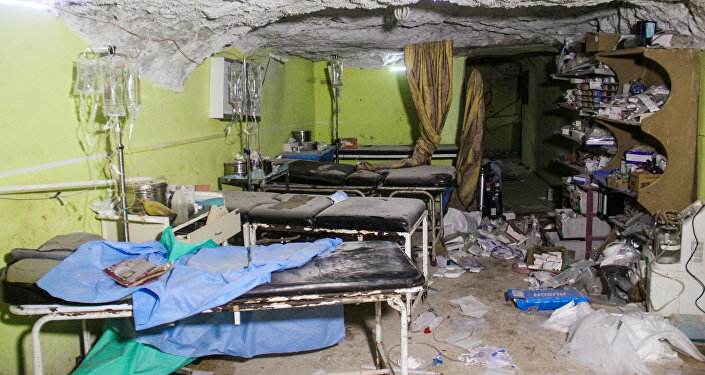 On April 4, the National Coalition for Syrian Revolutionary and Opposition Forces claimed that 80 people were killed and 200 injured in a suspected chemical attack in Khan Sheikhoun, blaming the Syrian government. Damascus vehemently rejected the accusations and said militants and their allies were responsible. Early April 7, the United States launched 59 Tomahawk cruise missiles at the Syrian military airfield in Ash Sha’irat, located about 40 kilometers (25 miles) from the city of Homs. US President Donald Trump said the attack was a response to the alleged chemical weapon use in Syria's Idlib, which Washington blames on the Syrian government. Russia described the attack as an aggression against a sovereign state. "In one of the largest sanctions actions in its history, OFAC is designating 271 employees of Syria’s Scientific Studies and Research Center (SSRC)," the Treasury Department's statement said. "These 271 SSRC employees have expertise in chemistry and related disciplines and/or have worked in support of SSRC’s chemical weapons program since at least 2012." The sanctions were imposed under an executive order that targets the Syrian government and its supporters. The 271 individuals sanctioned on Monday were designated for materially assisting, supporting or providing other support for the government, the statement explained. The sanctions imposed on Monday block the property of the sanctioned individuals that is subject to US jurisdiction and prohibit US persons from doing business with them. The US believes that Syria has an ongoing chemical weapons program, US senior government official told reporters on Monday. "I think in terms of whether they gave up their weapons capability or not, I think certainly the attacks of early April, and we think that was one of more than one attack over those weeks suggest that Syria has an ongoing chemical weapons program," the official stated. Earlier, the Russian Foreign Ministry reminded the Trump administration that all chemical weapons had been taken out of Syria in mid-2014 with the help of the previous administration of ex-president Barack Obama. Syrian President Bashar Assad said in an interview with Sputnik that Western states are blocking attempts to investigate the Idlib chemical incident because in the event of a probe it will be established that the "attack" was a false flag and lie. The OPCW announced in January 2016 that Syria’s weapons arsenal had been destroyed in accordance with an agreement reached after the 2013 Ghouta attack.